So there was some precedent for Alex to turn into the Scrooge persona he inhabited in the series’ season-two Christmas episode, “A Keaton Christmas Carol” (a follow-up to season one’s also-successful “A Christmas Story”). As has been depicted in too many sitcoms to mention, our lead character sees his Christmas past and Christmas future, having already groused up his Christmas present. A trip to Keaton past includes a look at grade-school Alex defending his hero, Richard Nixon, in the Watergate trials, but he’s still sentimental enough to insist on a family portrait around the tree. But Christmas future depicts an uncharacteristically bleak setting for the Keatons, as Alex has fired his father and run over their wagon, their only means of support, so they live in poverty, with a barefoot and pregnant Mallory, and Jennifer in the Tiny Tim role. Future Alex is a mean, fat, bald money-grubber, hurtful to the family that still inexplicably loves him. As it’s intended, the vision is jarring enough to cause a 180-degree turnaround in Alex on Christmas morning: He may be limited to convenience-store presents, but he now remembers how important that annual family Christmas tree portrait really is. 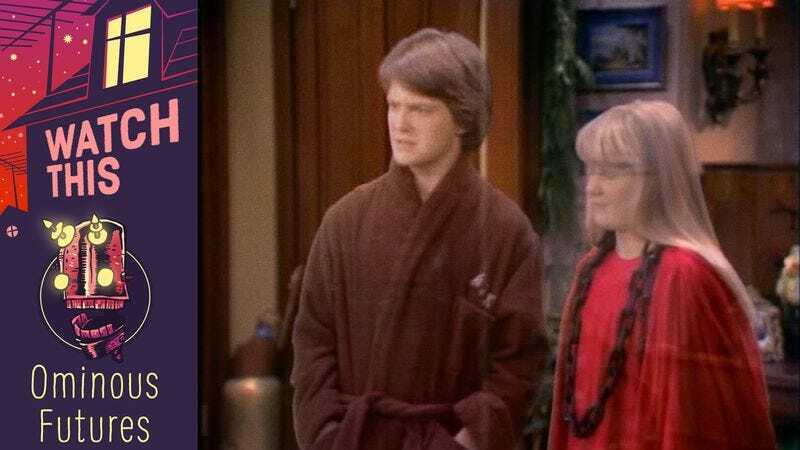 It’s the kind of emotional resonance that the series was able to land time and time again, making Family Ties a family sitcom for the ages. Pale, glib imitators like Growing Pains mimicked the sibling squabbles, but failed to offer that sincere kind of heart. Availability: “A Keaton Christmas Carol” is available in DVD box sets and streaming on Amazon Prime.